It’s not about climbing the ladder. It’s about serving your team, your organization, and yourself. It’s about being a CPA who can lead well. 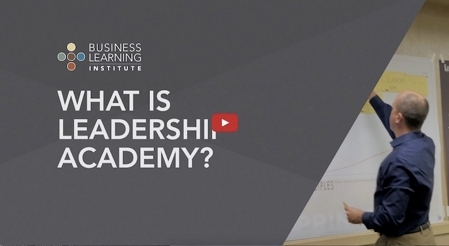 What happens at a Leadership Academy? In the fast-approaching future, successful CPAs must be leaders. Leadership Academy is the starting point for unlocking the full potential in the profession’s best and brightest young CPAs. This three-day event is cited by past participants as an invaluable boost to their careers. Participants will be actively engaged in dialog throughout the workshop and will be making presentations of their insights and action plans throughout the three days. Consistent with BLI’s approach to learning we will support the learning with active dialog and graphic facilitation techniques. Each young leader will leave with a set of tangible tools that they can use in their own organizations and as future volunteer leaders. FACILITATORS The BLI Leadership Academy is built around teaching participants the i2a: Insights to Action Strategic Thinking System framework. The i2a system was co-authored by Tom Hood, CEO of The Business Learning Institute, and Gretchen Pisano, President of Sounding Board Ink. CEO, Maryland Association of CPAs & Business Learning InstituteTom is the founding CEO of The Business Learning Institute, co-developer of the i2a: Insights to Action Strategic Planning Process, and i2a Leadership Academy. A nationally recognized author, speaker, and consultant, Tom is committed to helping individuals and companies shape their future. Tom has been recognized by Accounting Today Magazine as the second most influential leader in the CPA profession. Ms. Pisano has 18 years of experience developing sound business strategy, and specializes in the development of human potential across the personal/professional spectrum of life. Ms. Pisano brings significant consulting, teaching and coaching experience in the areas of strategic planning and insight, accelerated leadership skills, executive presence, heightened self-awareness, social intelligence, pro-active well-being, and resiliency. Ms. Pisano’s clients learn how to leave their mark on the world, in the process finding the “sweet spot” overlap of their strengths, their passions, and what others value. Whether entrepreneurs or leaders of an executive team of a multi-national organization, her clients are left with a deep sense of self and a personalized, compelling, vision in common.